Dom is a professor of Telecommunications at Ball State University and Senior Fellow of the Digital Policy Institute. He joined the Ball State University faculty in 1998. He previously taught at Saint Mary’s of Minnesota, Iowa State University and Missouri Southern, where he also managed the university’s low power television station. He is a Fulbright Ambassador, having served as a Fulbright Professor in Slovenia in 1995 and Greece in 2009. 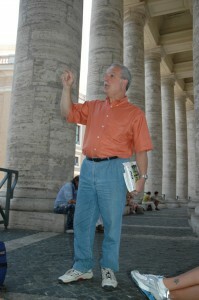 He has been a visiting professor in Italy with the Kentucky Institute for International Studies and AHA-International. His BA is from the University of Miami, his MA from University of Central Missouri and his PhD is from the University of Iowa. He has served fellowships with the Radio Television Digital News Association and the National Association of Television Program Executives. In 1998 he received the Distinguished Service Award from the Iowa Broadcasters Association. A member of the Broadcast Education Association for more than 20 years, he served on the Board of Directors 1997-2002, including a term as its Vice President. In 2012 Dom received the Ball State Outstanding Faculty Member Award. If the right of privacy is predicated on a reasonable expectation of privacy, have Americans abandoned that right? Should we worry about the date collected by the government more than we worry about the data collected by commercial interests? Have social media changed the equation? +The Battle Over Retransmission Consent: Who Loses? A free market for video content allows video channels to negotiate carriage fees with Multichannel Video Program Distributors, and allows program providers to negotiate licensing fees with video channels. Revenues are up, but who pays? Most people want the government to provide parks and roads, but what about telecommunications? Should municipalities provide broadband connections? Should the government build the next generation Internet? What about providing services in places where commercial providers have been slow to invest, such as low income and rural areas?